Chairman Bill's note: Author Peter Joffre Nye's latest work is his biography of Albert Champion, The Fast Times of Albert Champion: From Record-Setting Racer to Dashing Tycoon, An Untold Story of Speed, Success, and Betrayal (Prometheus Books) is available in hardcover and Kindle eBook. Champion (1878-1927) was an incredible man, as a bicycle racer he was winner of Paris-Roubaix and set more than a hundred world records. He went on to found both the Champion Spark Plug Company and General Motors Division AC Delco Systems. Just click on the Amazon link to the right to get your copy of this terrific book. Oh, and there's Nye's story of Joseph Magnani, the Illinois rider who challenged Coppi and Bartali. In a sport that puts a premium on champions with colorful personalities off the bicycle to match talent on it, Reggie McNamara excelled. An Australian expatriate who made New Jersey his home, McNamara led one of cycling's most anecdote-strewn lives. He amassed more than 700 victories in 3,000 races on three continents over three decades before he retired at age 50 in 1937making his career one of the longest in all of professional sports. McNamara soared to glory in six-day races around steeply banked indoor board tracks. Sixes equaled grueling marathons, six days and nights straight, and drew a phenomenal public following. Flashy riders like McNamara made big moneyas much as the best-paid major league baseball players of his era. Fortune magazine in 1935 even published a feature, generously illustrated with water color art and black-and-white photos, on six-days as a profit-making businesssuperceding professional basketball and football. As actor Bert Lahr, a fan best remembered for his role as Cowardly Lion in The Wizard of Oz, remarked: "Racing in six-days is a hard way to earn an easy living." How times have changed. Old Gold's tag line was "Not a Cough in a Carload". Can anyone imagine such an ad today? The winter indoor season kept riders traveling to international sixes in New York City, Buffalo, Pittsburgh, Toronto, Montreal, St. Louis and other cities. North America had as many sixes as Europe. To construct an indoor board track inside New York City's Madison Square Garden, or the Municipal Auditorium in Buffalo, or a railroad car barn in Pittsburgh, a crew of carpenters started swinging hammers on Monday and completed the track and surrounding grandstands by race start on midnight Saturday. Riders wearing vibrant silk jerseys swirling gracefully at speeds topping 40 mph around the tracks, typically 10 laps to the mile, thrilled spectators. Fifteen teams of two riders each competed, with one rider racing on the track while his partner sought refuge on the infield where riders ate and took cat naps in cabins hugging the inside perimeter. Six-day teams routinely went 2,500 miles. This approximates the distance of the Tour de France covered in three weeks. Crashes, an occupational hazard, routinely stuck riders with track splinters. McNamara used to say that he crashed up to 20 times in some sixes. A rider who knew him, national professional sprint champion Bill Honeman, confirms this. "Reggie did crash a lot," Honeman recalled. "But he caused a lot of his crashes. He would go and go and ride himself dead and then fall down." Surviving crashes became part of McNamara's legend. He liked to tell reporters, "I picked up enough splinters to build my own board track." McNamara suffered so many broken bones and took so many stitches to close wounds that the press and his fans called him Iron Manlong before the invention of the Hawaii triathlon. In an article he published in 1946 looking back on his career, he inventoried breaking his collarbone 17 times, fracturing his skull, suffering five concussions, breaking his nose and a leg, splintering his jaw with three fractures, and receiving more than 500 surgical stitches. One of McNamara's trainers, Fred Bullivant of Newark, declared, "He's so tough, that even adhesive tape won't stick to him." When a reporter asked McNamara if he parted his hair down the middle because movie star Rudolph Valentino did, he shook his head: "That's just so the sawbones has a centerpoint to start from." Such a wisecrack endeared him to reporters. They flocked to McNamara and wrote stories that were illustrated prominently, showing his trademark grin and black jersey. The press attention helped further his legend. The coverage also contributed to the mythology associated with his name as well as boosted attendance wherever he raced. McNamara was born November 7, 1887 in Grenfell, New South Wales, Australia. Even as a youngster he was rugged. When he was 12 and hunting rabbits with his brother, a snake bit him on the finger. He and his brother decided there was only one way to save his life out in the wilderness. His brother chopped the bitten finger off with a hatchet. At age 16 in 1904 McNamara started racing as a professional, skipping right over the amateur ranks, in local fairs around Sydney. He won his first race, a mile and a half on a dirt track. He worked his way up in the sport racing around Australia, neighboring New Zealand, and Tasmania. In early 1913 he triumphed in the Sydney six-day, a sign he was ready for cycling's major league. Alf Goullet, an Australian cyclist making a name for himself with victories in the United States and France, had returned to Sydney for a visit around that time. When Goullet received a cable from a promoter in Newark, New Jersey, asking him to recruit two of the best young Australian riders to race in Newark. Goullet told me, "I signed up Mac. I figured he was enough." Leaving Australia proved nearly disastrous for McNamara. An attack of appendicitis forced the ship he traveled on across the Pacific to make an unscheduled stop in Pago Pago for emergency surgery. On his first training ride on the Newark Velodrome, he fell and broke his leg. He was rushed to the hospital. There he met a nurse, Elizabeth McDonough, who treated him. They subsequently married and had two daughters, Eileen and Regina. They settled near Newark, in Bellville, and McNamara became a U.S. citizen. The marriage, especially to a nurse, must have helped his career. From 1915 to 1917 he set five unpaced world records on the Newark Velodrome at distances from 1 mile (1 minute 45 seconds) to 25 miles (53:38-2/5). Today those times still are considered fastleaving one to appreciate how much better he would have performed on lighter and more aerodynamic equipment available to modern riders. McNamara had strength, but his sprint lacked punch. He came into his own in six-day races, where he achieved his lasting fame, especially in New York City's Madison Square Garden sixes. Between 1918 and 1932, McNamara won seven of the Garden's races with six different partners. He also enjoyed immense popularity in Chicago, where he won five sixes in the Coliseum. A Chicago sports writer, Will Leonard, saw him in action and was so impressed he named his daughter, Regina, after McNamara. His best season was the winter of 1926-27 when he turned 39. He distinguished himself by winning the Garden's six-days in March and December in 1926, but only after narrowly averting disaster. In the final 15 minutes during the heat of the action in December when McNamara and his partner, Pietro Linari of Italy, were trading places, both were caught in a spectacular high-speed crash. They were knocked out cold. McNamara was the first to regain his senses. He staggered to retrieve his bicycle and told the doctor, "If my legs are all right, I'm going back in." He got back on his bike to win the race. Afterward, he discovered he had cracked three ribs. With a few days of rest, he shipped out to Europe with Harry Horan of Plainfield, New Jersey. They won the six-day in Berlin. Following a short rest, McNamara teamed with Belgian Emile Aerts to win the Paris six-day in January 1927. McNamara zoomed around Europe to compete in Belgium, Switzerland, Germany, and England. "The bike has been to me like the magic lamp to Aladdin, the flying carpet to the oriental prince, the fiddle to a gypsy," he said. His 19th six-day victory was in Cleveland when he was 45. He achieved it in January 1933. His partner was Norman Hill of San Jose, Calif., who was 26 and born the year McNamara began racing. "I grew up reading about riders like Mac," Hill recalled in an interview. "Being teamed with Mac made me feel confident. Mac was real steady, always there in the jams. He could go and go. Mac had a great tolerance for pain." Day and night, the race in Cleveland's Public Hall drew standing room only crowds. A newspaper account described the final night: "Shrieks and roar of 8,000 dazzled fans packed to the ceiling and crammed like sardines." McNamara and Hill battled against a dozen international teams. A Swiss team threatened to win. However, at midnight on that Saturday, McNamara-Hill scored a stunning triumphant upset. With sixes so popular, Warner Brothers Studio in 1934 released a movie, Six Day Bike Rider, starring comedian Joe E. Brown. It captured McNamara racing around the pine oval. The movie's levity was a welcome relief from the grimness of the Depression. Six Day Bike Rider enjoyed considerable box office popularity and rated as one of Joe E. Brown's stronger comedy vehicles. 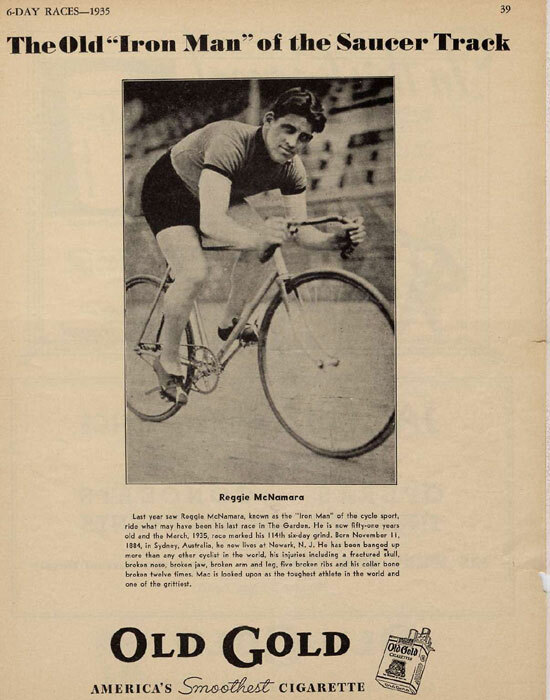 By the time McNamara hung up his wheels for good in 1937, he was 50. He is credited in VeloPlus, the Belgian reference book, with 19 six-day victories and finishing 108 sixes. He still ranks in VeloPlus's all-time top 25 six-day racers. Considering that he pedaled about 1,250 miles in each six-day, he churned some 135,000 racing miles in his careermore than enough to commute five times around the globe. Afterward, he worked as a referee for sixes. Then came outbreak of World War II, the decline of sixes, and the search for other employment in a public school cafeteria. He collaborated with reporter John T. Robinson on his memoir too late. The six-day era had ended and they failed to find a publisher. McNamara died at 83 of a stroke in October 1971 in Belleville, survived by his wife, daughters, four grandchildren and two great-grandchildren. 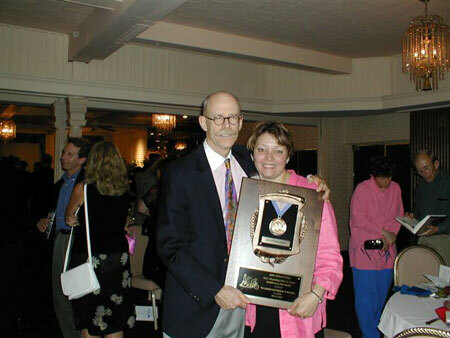 Lori McGowan, great-granddaughter of Reggie, holding the U.S. Bicycling Hall of Fame plaque May 2004 when Reggie was inducted. She is standing with the author, Peter Joffre Nye. Yet he is not forgotten. In 1968 he was inducted into the Madison Square Garden Hall of Fame, only one of two cyclists ever inducted, and in 1990 into the New York Sports Museum & Hall of Fame. Recent McNamara sightings continue. He still leans at speed around the velodrome in television rebroadcasts of Six Day Bike Rider.